I am going to try and keep this short and to the point, but I can’t promise. I want to start off by saying that I am totally biased in favor of Ed Coan. He was and still is the guy that I look up to in a sport that I love. 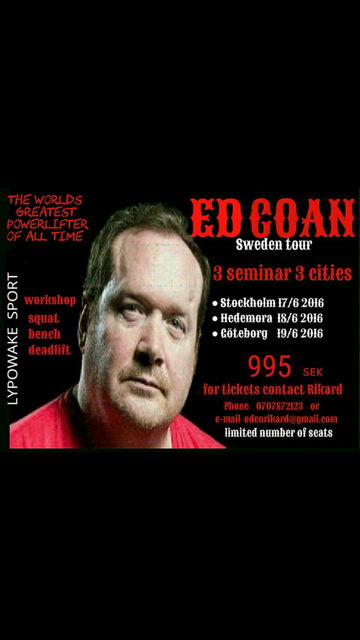 Ed Coan is the greatest powerlifter of all-time. That isn’t up for debate! However, what people don’t know is that he is the nicest guy in the sport. Heck he is the nicest guy in the iron game. In a sport full of Pit Bull mentalities, it was refreshing to meet a nice guy like Ed. When I was up and coming, he was the first guy to speak to me, and to give me ongoing encouragement. That meant a lot to me especially since he was the very guy that I watched on video tape every day of my life. Yeah I am a little obsessive. Dave Tate was the first person to bring this to light. When I read it, I was definitely fired up. The whole thing also confused me. Immediately, it looked personal to me. 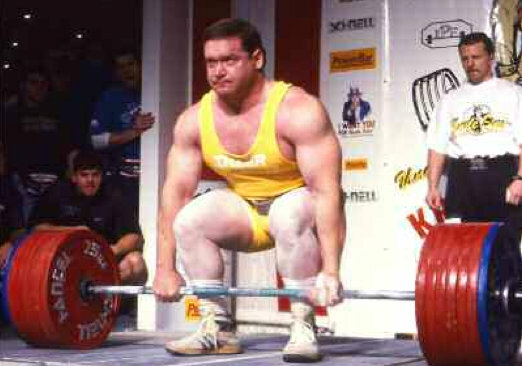 I have been in the Olympic weightlifting world longer than I was ever in the powerlifting world, and I can say that this rule is rarely ever enforced. USA Weightlifting has never called out people that are on this list for hosting seminars, online coaching, and/or coaching at a National event. I suspect because the rule is so vague that it isn’t in their best interest. USA Weightlifting has definitely never called out someone by name to warn their members not to do business with these individuals. I am sure that it isn’t worth their time, and they know that it would be hard to make something stick. It is silly! That’s what it is. Here is an excerpt taken directly out of the WADA handbook: “Athlete Support Personnel (and other Athletes they associate with in a professional or sport-related capacity) “. What does that mean? I could understand coaching, or maybe forming a partnership in a powerlifting gym with someone banned, but I don’t understand a seminar. I host seminars all the time, and that doesn’t make me partners with the attendees, and I am not their “support personnel”. People brought up great points as well about the Arnold Classic. Anyone that attends that event is in danger of violating this rule according to the IPF interpretation. If you talk to a banned athlete and exchange ideas, you are now in violation. What are you going to do? You will need to carry around that list and check out and see if the person you are talking to is on that list. Yeah this is crazy!!! I know that writing this will put me under fire from the IPF, but dang it Ed is my friend. I plan on taking athletes to the USAPL Nationals, so hopefully they won’t hold this against me. I am writing this to instigate change. Calling people out by name and warning people not attend their seminars during a competition that has nothing to do with your organization will not help your chances to get in the Olympics. It simply makes you look unappealing to new potential athletes. Here is the thing. I love powerlifting. I love the IPF. 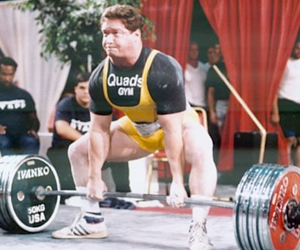 I just want things to get better in the two iron sports that I love: Olympic weightlifting and powerlifting. USA Weightlifting in America has gotten so much better in my opinion. I love the way that the USAPL and the IPF are keeping powerlifting professional. 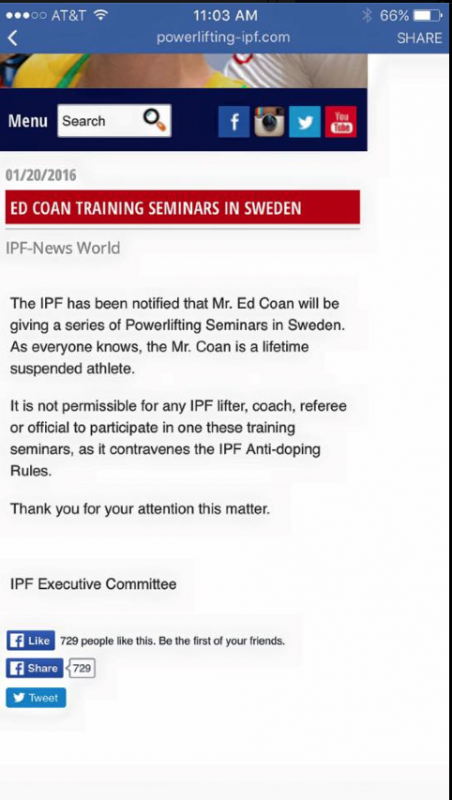 All that I am saying is that someone needs to let go of his or her personal vendetta with Ed Coan. He isn’t trying to coach at the IPF Worlds. He is simply trying to pass on the knowledge that he has required over the 35+ years of his career, and finally make a living that he has broken his body for. I hope that this doesn’t get me black balled from the USAPL, but not saying anything makes me guilty by silence. I want to see things get better. I also hope to be a bridge someday between weightlifting and powerlifting. I hope that this doesn’t change that. I enjoyed my time as an athlete with the USAPL and the IPF, and I look forward to coaching my athletes all the way to the top in both.